At this very moment, in this beautiful life, you are right where you belong. If you’re uncomfortable, remember, it’s only temporary. If you’re in pain, even the deepest wounds will heal over time, as long as you allow them. If you’re scared, know that someone is always walking alongside you. If you are joyful, vow to hold onto joy throughout the difficult times. 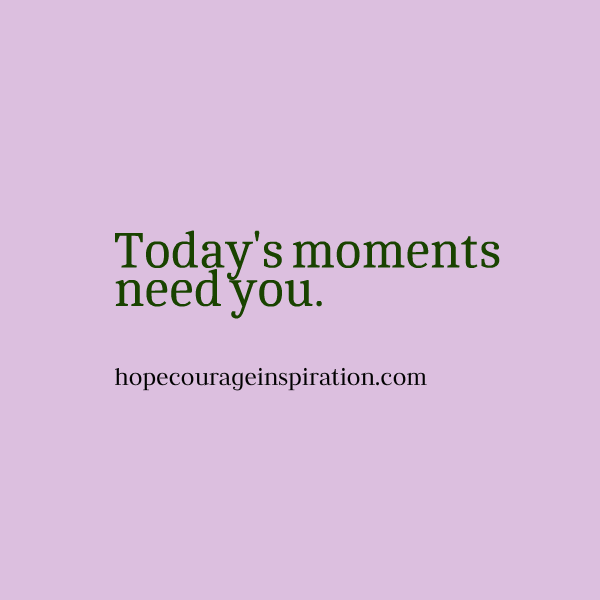 No matter where you are in life, you need today’s lessons and today’s moments need you. Today is a necessary step in fulfilling tomorrow’s promises. Sometimes, we avoid experiencing today. Somewhere inside, it’s possible we believe that we don’t belong here. But nothing could be further from the truth. Without today, there is no tomorrow. And if we discard the importance of living right now, in this very moment, the beauty for which we’re meant sneaks by. We miss the beauty of right now. Don’t wait for everything to be “perfect,” for it may never come, and that’s okay. Instead, choose to enjoy the ride, no matter the circumstances. Make the choice to be at peace with what is and what is not. Even though we can’t control what happens to us, we can control how we react, and in that, there is infinite power and limitless pathways to joy. Right here, right now, you’re meant for this. You are where you belong.